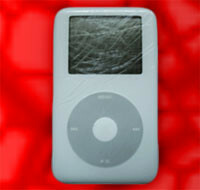 Does your iPod look more like the photo on the right or the left? Chances are the average iPod owner will collect a few scratches here and there over time. That’s especially true for iPod Nano owners. But if your iPod looks like it got into a fight with a gang of alley cats, then you might want to check out a company called ColorEnvy. ColorEnvy provides scratch repair and custom paint jobs for your iPod. To help promote their services, they they are currently running a contest to find the world’s “worst scratched iPod.” The winner will receive a full refurbishing and custom coloring of their choice, as well as a free iPod scratch removal kit for any future accidents. To enter, just email them a picture of your scratched iPod. If you want to see who you are up against, check out the other contestants on display in the ColorEnvy gallery. The contest ends August 1st. Good luck and next time get yourself a good protective iPod case.